PMBA students visited Mercado de Liniers, the largest and most important cattle market in Argentina, during their international business trip. It's not uncommon for business schools to have site visits to corporate boardrooms or operational centers. It's more uncommon that students have the opportunity to tour an international shipping port or ground zero for the growth of a nation's wine industry. But students in the inaugural Professional MBA (PMBA) cohort experienced each of these during their recent trip to Argentina and Uruguay. For the MBA students, the trip was the chance to see how cultures influence business practices, something easier seen firsthand than read about. "The trip [demonstrated] the value of spending time immersed in a city to build a … sense for the culture as it guides how business is done," said Susan Fortkiewicz, MBA '14 and a project manager in Global HR Operations at CSC. "[It] unmasked an interesting European-feeling atmosphere, which helps to explain the way certain businesses are run and interactions are handled," she said. 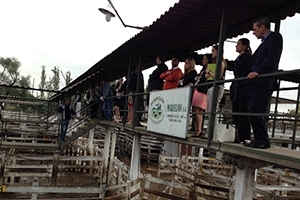 In addition to visiting South American branches of U.S. companies like Microsoft and EY, formerly Ernst & Young, the cohort toured local companies like NXTP Labs, an accelerator program focused on technology startups in Latin America, and Mercado de Liniers, one of the largest cattle auction houses in Argentina. Watch a student-produced video from the trip on our Kogod YouTube channel. According to the students, the PMBA program's cohort structure and close friendships enhanced their whole experience, including free time, site visits and tours. "Studying abroad with the cohort was a … special experience. Our relationships gave us the confidence to speak up during presentations, form groups easily, encourage one another with our ideas, and engage in deeper discussions about our site visits," said Traci McCombs, MBA '14 and an HR specialist at the National Institutes of Health. McCombs, Fortkiewicz, and their fellow students will graduate in December of this year, the first cohort in the Professional MBA to do so. The second cohort will travel to Brazil in May 2015 for its international business experience.